Machine learning is the latest, most significant strategy computer scientists are using to move toward artificial intelligence. In the past few weeks, MIT scientist Brad Hayes has applied the concept to the 2016 presidential and created a Donald Trump Twitter bot called @DeepDrumpf. It uses an algorithm to learn how to craft Trump-like tweets not only from Trumpisms Hayes inputs into the bot, but also from its own previous tweets. And it seems like the process is working. In the beginning, @DeepDrumpf’s tweets were pure nonsense; now, they at least resemble coherent statements—though obviously, given the source material, they’re still batshit crazy. 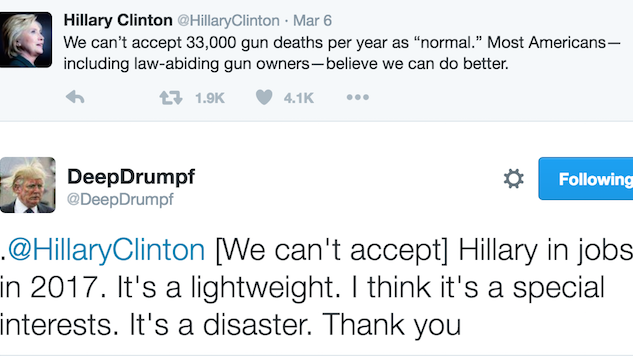 One of the most interesting things about @DeepDrumpf is that it’s able to respond to other Twitter users. It’s shot barbs at Hillary, John Kasich, Marco Rubio, Ted Cruz, Bernie and even non-candidate Trump enemies like John Oliver and Ricky Gervais. Click through the gallery we’ve compiled of some of @DeepDrumpf’s most incredible work. He drops gems like “Have a gun on every table,” “I make the best college,” and “Come replace the big lie, Obamacare.” But our personal favorite is this: “We need a truly great leader now. Nuclear weapons and me.” Hard to state it more bluntly than that, @DeepDrumpf. Hayes has also created a @DeepLearnBern, which is coming along nicely and will soon be able to debate @DeepDrumpf. We’re hoping that @DeepKanye is next.